Fresh food has long been a point of distinction for vending operators, as it provides one of the few areas where an operator can offer products that set their service apart from the competition. At the same time, fresh food requires a major investment in a product category that on its own, is rarely profitable. Vending operators have offered fresh food to locations knowing the quality of their food can be the determining factor in winning the business. In most situations, however, the fresh food is viewed as a “loss leader.” The operator seeks to offset losses from the fresh food with profits from their candy/snack and beverage machines. Luke Saunders wasn’t thinking about any of this when he came up with the idea for Farmer’s Fridge, a vending machine exclusively offering fresh food. Instead, Saunders was trying to find the solution to a problem that he himself encountered while working as a salesman spending a lot of time in airports where he had a hard time finding fresh food. Saunders developed a business model to allow fresh food packaged in plastic jars to be delivered to vending machines in a timely manner based on individual location preferences. He also designed a glassfront vending machine to monitor inventory, transactions and temperature in real time. The first Farmer’s Fridge machine debuted in a Chicago food court in 2013. The menu included items such as Tarragon chicken salad wrap, organic Bolivian Royal Quinoa, pineapple coconut chia pudding, smoked cheddar Cobb salad, pesto pasta bowl and sprouted grain tortillas. The single-serve offerings, served in recyclable jars that can be returned to the machine, were priced between $4 and $12. Farmer’s Fridge prepares its food in a kitchen hours before delivery. The food is sourced from small, independent foodservice suppliers in addition to broadline foodservice distributors. The drivers deliver the food from the kitchen in temperature-controlled vehicles daily. All the data – operational, web/mobile and consumer – sits on the cloud. The company uses a “cost function” algorithm that determines the probability of a specific product selling at a particular location. The supply chain is monitored end-to-end to ensure peak product freshness. The software enables the company to replenish the machine based on the location’s needs. Surplus food is donated to local food depositories, providing fresh, healthy options for community members in need. The customer can check machine inventory, menu and ingredient information remotely using a mobile app, or on the machine’s touchscreen. They can shop the machine’s inventory by category – sandwiches, snacks, bowls, salads, proteins or drinks. They can also place their order using their app and pick up at the machine by entering a code. Where product waste for cold food vending machines can be as high as 40 percent of the machine’s inventory, Saunders claims a product waste target of 5 percent. Saunders credits the low product waste to the short time from production to delivery and his cost function algorithm. 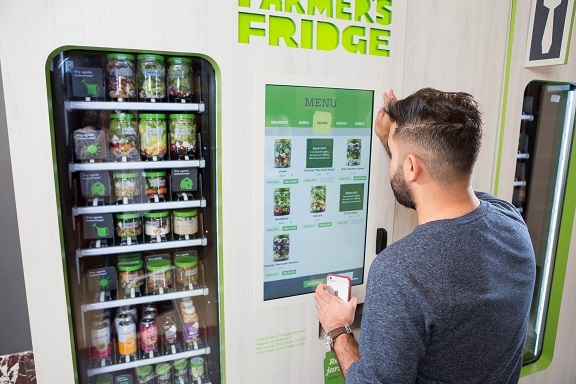 Farmer’s Fridge currently has around 186 self-serve machines in high traffic locations in Chicago and Milwaukee. The company recently closed on $30 million in a round of financing led by Innovation Endeavors, along with Cleveland Avenue, GreatPoint Ventures, DNS Capital, ag investment pioneer Finistere Ventures, Danone Manifesto Ventures, DOM Capital and Hyde Park Angels. The new funding follows a $10 million round last year from Cleveland Avenue.